Following the success of our summer photo walk, we decided to share points of interest along South Bank so that you can find out more and explore some of the area's more hidden gem. If you visit, don’t forget to share your photo's on Instagram #mysouthbank and be in with a chance of getting featured! The beautiful exterior of the IWM (Imperial War Museum), with its imposing 15-inch British Naval Guns, makes for a stark and beautifully composed photograph. IWM London was originally housed in the Crystal Palace at Sydenham Hill and the museum opened to the public in 1920. In 1924 the museum relocated to the Imperial Institute in South Kensington, and finally in 1936 the museum acquired a permanent home at what used to be the Bethlem Royal Hospital in Southwark. The Bethlem Royal Hospital was Europe's first and oldest institution to specialise in mental illnesses and was informally and most notoriously known as “Bedlam”. The museum recently underwent a £40 million refurbishment, including a suite of permanent new galleries devoted to the First World War and a vast, light-filled central atrium. House of Vans is located in what used to be known as the Old Vic Tunnels. The space covers just under 30,000 square feet of unused railway tunnels. The Old Vic, which was under Kevin Spacey’s directorship at the time, originally acquired the space back in 2010, using it as an underground arts venue and performance space. Numerous high-profile events, including the UK premiere of Banksy's documentary Exit through the Gift Shop was hosted here. In August 2014 the space reopened under new management and the name House of Vans London. The House of Vans in London describes itself as “the physical manifestation of the culture and creativity that has defined the Vans brand since 1966”. This cool underground space is now used as a sanctuary for embracing creative expression through art, music, skateboarding, BMX, street culture and fashion and offers a solid platform for local communities to experience and engage with Vans’ ‘Off The Wall’ spirit. As well as being the home of London's only indoor skate park, House of Vans also includes a 850-capacity music venue, where the Foo Fighters once did a secret gig! HOV also has a 160-seat cinema and a gallery, as well as two bars and an industrial-looking cafe serving American-style food, The Wall SE1. Best of all, everything at House of Vans, from the skate park to the cinema, is completely FREE! They often host amazing workshops such as screen-printing, drawing and dubstep remixes, so make sure you keep an eye on what's on. The London site is the second House of Vans and the first to open in Europe. The other, in Brooklyn, New York, also hosts a music hall and skate park. Leake Street, also known as "Banksy Tunnel" or "Graffiti Tunnel", is a graffiti artist or graffiti admirer’s paradise, located right next to House of Vans. The tunnel is about 300 metres long, running just off York Road, all the way under the platforms and tracks of Waterloo station. The walls are decorated with graffiti - initially created during the "Cans Festival" organised by Banksy on 3-5 May 2008. During the Cans Festival, Leake Street was turned into a giant exhibition space for some of the world’s top graffiti artists, including C215, Blek le Rat, Faile, Pure Evil, Logan Hicks, Eelus and Banksy, as well as members of the public who were also invited to join in. The half-mile stretch of the tunnel in Leake Street, Waterloo, transformed what used to be a dark, forgotten corner of London onto a cutting edge exhibition space, is London's biggest legal graffiti wall and is often used by fashion photographers and frequented by graffiti aficionados. The lush green pastures of Jubilee Gardens, was formerly the site of the “Dome of Discovery” and the adjacent “Skylon” during the Festival of Britain in 1951. The Festival was a national exhibition held throughout the UK, organised by the government to give the British a feeling of recovery in the aftermath of war, and the Dome of Discovery was a temporary exhibition. The dome was controversially demolished and its materials sold as scrap, which rather peculiarly was then turned into a series of commemorative paper-knives! After being left for many years as a derelict site, Jubilee Gardens was subsequently created in 1977 to mark the Silver Jubilee of Elizabeth II. The park is the site of a memorial to the casualties of the International Brigades of the Spanish Civil War, especially the British Battalion which took very heavy casualties. The park is the perfect place to get some of the best shots of the Coca-Cola London Eye, which stands directly before it. The London Eye, also known as the Millennium Wheel, is over 135 metres (443 ft) tall and the wheel has a diameter of 120 metres (394 ft). When erected in 1999, it was the world's tallest Ferris wheel, described by its operators as "the world's tallest cantilevered observation wheel". It remains Europe's tallest Ferris wheel and is the most popular paid tourist attraction in the UK, with over 3.75 million visitors annually! From the top of the London Eye you can see up to 25 miles away, and on a clear day, you can make out Windsor Castle. 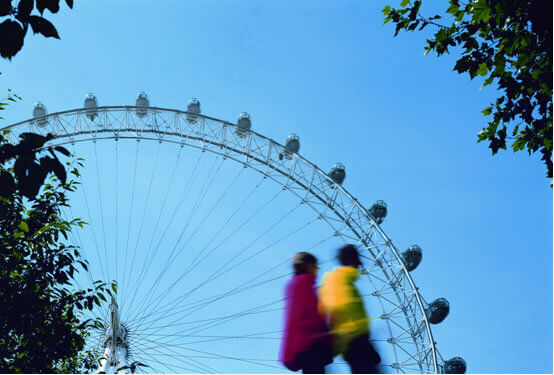 The London Eye’s 32 capsules represent the 32 London boroughs, with each one weighing around 10 tonnes and can carry 25 passengers. The London Eye was supposed to be a temporary structure in the run up to the Millenium, however it was so loved by Londoners and visitors alike that it stayed a permanent fixture and is now an iconic part of London’s skyline. The London Eye is the focal point for London’s New Year’s firework display, and lights up in various colours to celebrate events such as the colours of the Union Jack to celebrate the wedding of Prince William and Kate Middleton, rainbow coloured to celebrate London Pride and all green to welcome the addition of Shrek’s Adventure to the South Bank. In 2009, the London Eye underwent a £12.5 million capsule upgrade, whereby each capsule was taken down and floated down the river to Tilbury Docks in Essex. The Southbank Centre is a complex of artistic venues including the Royal Festival Hall, the Queen Elizabeth Hall and the Hayward Gallery and is Europe’s largest centre for the arts, attracting more than three million visitors annually. Nearly a thousand paid performances of music, dance and literature are staged at Southbank Centre each year, as well as over 300 free events and an education programme. The history of Southbank Centre starts with the Festival of Britain, held in 1951. As aforementioned, the Festival of Britain was created as "a tonic for the nation" by Labour Party government, with the intention of boosting the nation’s morale after the Second World War. The festival ran from May to September 1951, and by June the following year most of the structures had been dismantled following the victory the Conservative Party in the general election of 1951. The Royal Festival Hall is the only building from the Festival of Britain that survived; the rest was (controversially) demolished. From 1962 to 1965, the Royal Festival Hall was extended towards the river and Waterloo Station and refurbished and a second concert hall and an art gallery were added. It was another 12 years before the Queen Elizabeth Hall and the Purcell Room opened to the public. Together, they were to be known as South Bank Concert Halls. In 1968, the Hayward opened, under direct management of the Arts Council. The Southbank Centre are currently refurbishing their iconic 1960s Brutalist venues – the Queen Elizabeth Hall, Hayward Gallery and Purcell Room – and have plans to make public spaces around the site more attractive and accessible. Their ambition is to fully pedestrianise the route to the river between the RFH, QEH and Hayward Gallery; to extend the popular Queen Elizabeth Hall roof gardens; to create new performance spaces, and to improve the connections between Southbank Centre and its neighbouring area. The need for a national theatre was first proposed in 1848, but it took over 100 years for the project to finally be brought to life. The foundation stone was laid in 1949, but in 1959 the government stated that the nation couldn’t afford a national theatre, and so it wasn’t until fairly recently – 1963, that the National Theatre Company was eventually formed. Even then, the company was based at the Old Vic and didn’t actually open in South Bank until 1976, with its first production of Hamlet at the Lyttelton Theatre. The Olivier and Cottesloe theatres (now called the Dorfman) were opened shortly after, and the Oliver is modelled on the ancient Greek amphitheatre at Epidaurus, the oldest theatre in the world. The Olivier has a massive stage revolve that extends 8 meters below stage. The National Theatre building was designed by Sir Denys Lasdun, and was notoriously described by Prince Charles in 1988 as "a clever way of building a nuclear power station in the middle of London without anyone objecting". The building certainly doesn’t leave anyone cold, and is in the unusual situation of having appeared simultaneously in the top ten "most popular" and "most hated" London buildings in opinion surveys! Despite the controversy, the National Theatre was awarded Grade II listed status in 1994 and is often cited as an archetype of Brutalist architecture in England, as well as having been compared to the work of the famous French architect, Le Corbusier. Recently, a new lighting scheme was introduced, with colourful floodlights illuminating the stark edges of the building, which has proved extremely popular with the public. Also popular is the temporary theatre in front of the National Theatre, which is a favourite spot for taking pictures. The red structure will be in situ until March 2017. The National Theatre houses three auditoriums and a number of rehearsal rooms. Unusually for a theatre, the National also has set-building and scenic painting workshops, costume- and prop-making and digital design in-house; with around 1,000 people working on its five-acre site. You can see all of the action from the newly introduced “Sherling High-Level Walkway” – an amazing walkway from which you can see all of the backstage action going on. Since its inception, the National Theatre has presented over 800 productions, with some transferring to the West End and occasionally to Broadway. If you can’t make it to a performance, you can watch live broadcasts of the shows at many cinemas across the UK and the world with the National Theatre Live programme. It’s crazy to imagine that Gabriel's Wharf used to be the site of old garages – now, the Wharf is a popular place for families and visitors to relax and enjoy great views across the Thames and onto London. The opening of Gabriel’s Wharf in 1988 brought commercial and public life to an area that had long been derelict and signalled the ‘rebirth’ of the South Bank. The area has been completely redeveloped and is now is a buzzing spot with a range of boutiques run by small businesses who design and manufacture their own products, artist’s galleries and eateries. The area includes Bernie Spain Gardens, named after Bernadette Spain, a local campaigner on health and housing provisions for the area’s residents in the 1980s. If you enjoy a spot of gardening, why not join in the “Gorgeous Gardens” gardening sessions, which are held regularly throughout the growing season and are open to anyone with an interest in growing. Especially popular with kids, this is a great way of spending some time outside and feeling connected with nature – right in the heart of London! The fabulous, art deco OXO Tower is one of the most prominent buildings in London’s South Bank. The tower has mixed use, with a set of design, arts and crafts shops on the ground and first floors as well as two galleries, Bargehouse and [email protected] The OXO Tower Restaurant, Bar and Brasserie is on the eighth floor, offering fantastic views over London. The building was originally constructed as a power station to supply electricity to the Royal Mail Post Office and was subsequently used by the manufacturers of OXO beef stock cubes as a cold store for many years. The company famously wanted to include illuminated advertising of their product along the side of the tower, however, permission was denied as advertising along South Bank was banned at the time. However, OXO managed to cleverly go around this by building four sets of three vertically-aligned windows, all of which "coincidentally" happened to be in the shapes of a circle, a cross and a circle! After OXO left, the building was left derelict until the late 1970s and early 1980s. Proposals to demolish the building were met by strong local opposition and finally, the entire 13-acre (5.3 ha) of land was sold to the non-profit Coin Street Community Builders for just £750,000! The sleek and sophisticated Mondrian Hotel at Sea Containers was designed by architect Warren Platner in the 1970's. Although it was originally designed as a hotel, it was instead used as an office for many years. One of the occupants was a shipping company called "Sea Container", from which the Hotel now famously draws its name. The hotel’s interior was completely redesigned by Tom Dixon, who based his inspiration on the days of glamorous transatlantic cruise travel. You can see this from the port-holes near the front desk, the huge copper hull and the maritime references throughout (look in the den!) All the rooms have a signature Tom Dixon wingback chair. The hotel has only been open for just under a year, however already has got rave reviews from guests and has already been awarded a Trip Advisor Certificate of Excellence. In addition to this, the hotel’s flagship bar, the Dandelyan, recently won Best New International Cocktail Bar, and its bar manager, Ryan Chetiyawardana (also known as Mr Lyan) was recently awarded International Bartender of the Year at this year's Spirited Awards. The exclusive culinary director at The Sea Containers restaurant, Seamus Mullen, is also the owner of 4 highly reputed restaurants in New York. After contracting rheumatoid arthritis, Mullen cured himself through a regime of diet and wellness – writing a highly successful book detailing his journey (called Hero Food).